A powerful tool to help you lose weight is to visualise yourself at your target weight and imagine the life you will be living. Here, we share 23 questions to ask yourself in order to help you see yourself slim. If you want to get and stay slim, you have to be able to imagine what your life is going to look like. If your mind cannot imagine it, then the chances that you will achieve it are very small. The more you can imagine yourself living a slim healthy lifestyle, then the more your mind will start thinking: “Yeah I can see myself living like this” and the more you will start to think, speak and act like the slimmer new you!! You cannot underestimate the power of your mind when it comes to your body. It really is crucial to be able to see yourself living a slim healthy lifestyle. The more you imagine it, the more clearer the picture is in your mind’s eye and the better chance you will have for it to become your reality. We place so many limits on ourselves by our mindset, and the fact that we do not allow ourselves to imagine that it is possible for us to live a slim healthy lifestyle, and be able to maintain our slim figure. Use the time you are on TFR to get REALLY CLEAR on how you will be living when you are slim. You need to change your lifestyle and make healthy choices. To help you to get a clear picture in your mind, and start imaging your slim lifestyle start by answering these 23 questions. 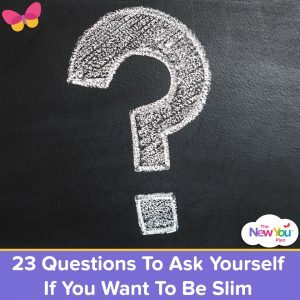 When you can answer these 23 questions with confidence and a clear image in your mind, seeing yourself doing, being, feeling, acting the way the slim new you will, then it will be much easier for you to start believing in yourself that you can get AND STAY slim. What style is your wardrobe? What type of events are you going to? What are you doing on a daily basis? What is your romantic life like? What do you eat when you go to a restaurant? What do you drink when you go out socialising? What meals to you plan and cook when you are at home? What drinks do you drink throughout the day to quench your thirst? What is your career / business life like? What is your family / home life like? What type of holidays do you go on? What time do you get up at every day? What do you feel like when you need to get your photograph taken? What do you feel like when you are going to spend time on a beach / swimming pool? What size of clothes do you wear? What do you eat when you go to the cinema / have a movie night? What do you do when you are not hungry but offered a big piece of cake at a friend’s / relative’s house? 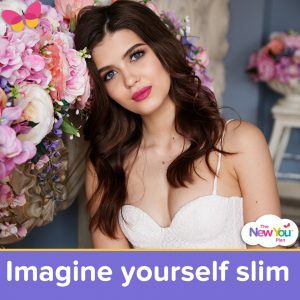 Spend time everyday imaging yourself at your goal weight, and all the things you will be doing to maintain and enjoy your new healthy slim figure. If you go back to your old habits you will get back your old body. Use your time on The New You Diet Plan to change your lifestyle and mindset to support the new slim you when you are at your goal. If you want total transformation of your body, then you need to totally transform your mind and your lifestyle too.